Our aim in the COTZ trial has always been to test private sector market-based approaches to distributing a new anti-diarrhoea kit (Kit Yamoyo). 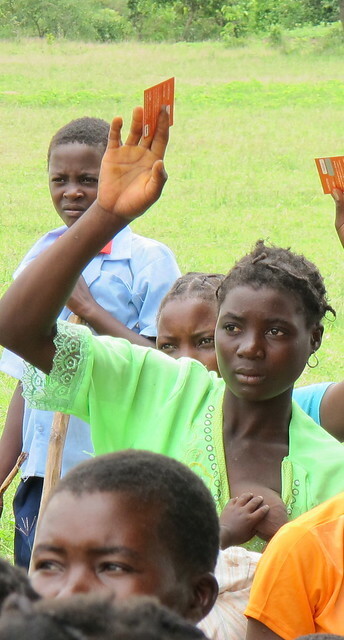 That was the model that our Zambian partners proposed and preferred – including the Ministry of Health. They wanted a ‘trade-not-aid’ model – and we agreed – although we have been able to bring in elements of each to create a kind of hybrid. This set us a number of conundrums. How do you create a market in remote communities for a brand new product in just a few months, so you can test its value chain? What does ‘affordable’ mean? What potential is there for supporting equality of access via the private sector now – and in the future? This is where the voucher-assisted model came in. And despite a steep learning curve all round and a host of ‘teething problems’, it has done what we intended: catalyze demand and create a ‘pull’ for Kit Yamoyo to some of the most remote communities in Zambia. 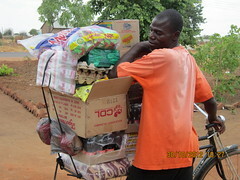 But to what extent could the value chain be maintained WITHOUT vouchers? How do you balance an entirely sustainable, private sector model with equity of access for the poorest? These are obviously key questions. As we expected, since the withdrawal of the vouchers, sales of Kit Yamoyos have fallen sharply, and it is only now that we are seeing faint signs of them picking up again. 1 No cash in communities? Agricultural communities do have cash – but it is very seasonal. It is harvest time at the moment in Kalomo (Maize, Tabacco, Cotton) and Katete (Maize, Cotton) which means that many people don’t have cash at the moment. They are harvesting their crops but are yet to be paid. The tobacco harvest comes in a little earlier, and interestingly we have seen an earlier pick-up of sales in Kalomo where tabacco is grown. On the other hand, there is some money around for family emergencies: it has never been easier for people in rural areas to contact their richer relatives in the towns and ask for cash to be transferred to them – all through the mobile phone. This is the dry season – the time of year when diarrhoea rates are at their lowest. Our midline survey, undertaken in Mar-13 showed that 24% of children had had diarrhoea in the last 2 weeks compared to 33% in Aug-12 when we did our baseline survey. 3 Have we flooded the market? In each of our trial areas, 14,000 vouchers have been circulating and overall, over 21,000 Kits have been bought by shop-keepers. Households have exchanged vouchers for kits and it is possible that quite a few have a Kit Yamoyo in the house ready for the day diarrhoea strikes. So, when it does, they don’t need to buy, they just use the kit they already have. Last week we met a group of 12 women at Bbilili Rural Health Centre in Kalomo. Two had used Kit Yamoyo already and another two had Kit Yamoyo in their home unopened. Hardly a big or representative sample but indicative that there may be a significant number of kits in people’s homes (which is where we want them to be) waiting to be used. 4 Too many ORS sachets per kit? Each Kit Yamoyo contains 8 200ml ORS sachets – we erred on the side of caution in supplying a generous amount. It turns out that this is more than enough for one episode of diarrhoea. Our midline survey showed that 80% of women used 4 sachets or fewer. This means that there will be ORS sachets left over from the first use of the kit and it is therefore likely that when diarrhoea strikes again that the child will be given the remaining ORS and the mother may not buy another kit. In this case, the child will be disadvantaged as it will not get the benefit of the Zinc. So, one thing we are doing, is reviewing the kit contents – this will also help reduce costs – and encourage adherence to the combination therapy of ORS and Zinc. So, where are we now? Will the market pick up when the harvest is in? Or when the dry season impacts on the water table and water quality, and diarrhoea rates rise – as we know they will? Or when the Kit Yamoyos and extra ORS sachets in households get used up? When the harvest comes in, will there be enough cash ‘value’ at the end of our value chain to keep the kits moving? 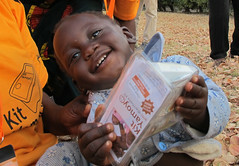 We would be very concerned at this point if it wasn’t for one thing: Kit Yamoyo delivers beyond mothers’ expectations. Our midline shows that around 30% of mothers have used it in our target areas. We think this will be enough to ensure that cash sales will pick up over the next couple of months. On the other hand, it may be that K5.00 is just too much for poor rural people to pay. Either way the trial will give us the answer and indicate the way forward. Hi guys! It’s me again in Canada. I was just wondering if Kit Yamoyo had a hard re-sealable lid? I found whe I was in Western Province , besides the seed I brought being very popular, the tupperware with sealable lids was very desirable. Just a thought! Keep up the great work and good luck. Also I am surprised that the rates of diarrhea were lower in March that August as August is dry and March is just coming out of the rainy season. Therefore wouldn’t it mean that Kit Yamoyo is working as you had less in Mar.13 than last August. Happened to stop by your blog today and saw this post on the voucher sales. I commend you for sharing the ups and downs in the trial so openly. I’ve seen a lot of projects over the years be less than forthcoming with these kind of results. A few thoughts. Right now the communities you’re in are normally pretty flush starting about now due to cotton and other cash crops; though this year’s cotton crop in particular is literally about half of last year and the price has gone down. People will sell some maize early to traders for cash to smooth out cashflows before FRA (Food Reserve Agency) kicks in. But I think your points 2/3/4 are quite interesting (individually and in combination) and really worth exploring. Very interested to hear how your research continues with the changes in sales and look forward to you sharing your learning! Thanks for your question. The kit contains 8 sachets of ORS and one course of Zinc (10 tablets). This means that if used properly all the Zinc is given during and following the first episode of diarrhoea. Typically, up to 5 ORS sachets and all of the Zinc tablets are given during the first treatment which means only ORS sachets are left for the second episode. For more information of the kit and its contents please see: https://colalife.org/aidpod.